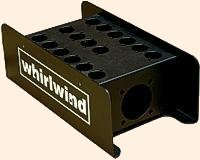 HBB16W5PPUS These heavy-gauge, cold-rolled steel boxes feature a textured, black, powder-coat finish. They are the same boxes we use for our Medusa Snake systems. They are available blank or punched with XLR holes which will accept Whirlwind XLR and WCQF connectors and the 2-piece construction allows easy access for wiring. Boxes come complete with a cable entry hole, a carrying handle and rubber feet. Strain relief is not included. BK boxes include a wire mesh strain relief and any combination of Whirlwind XLR female or male connectors or TRS 1/4" jacks (specify connectors when ordering). Most boxes can be custom engraved as required.